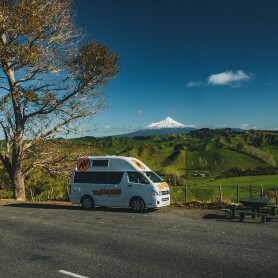 Excited to plan your campervan trip in New Zealand from Christchurch to Dunedin? A campervan hire is perfect for a great adventure. 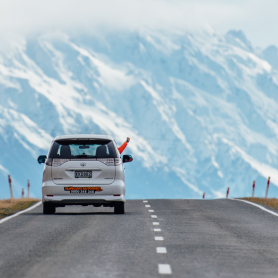 You can travel from Christchurch to Dunedin in as little as five days or extend it over a few weeks. There are several different routes to take, and we are sharing three fun-filled itineraries to consider. 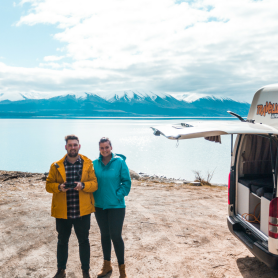 Pick up your Christchurch campervan hire and head southwest through the Canterbury Plains, which are known for their patchwork quilt greens. Take State Highway 72, the Inland Scenic Route. Find lots of hidden treasures along the way like the Pleasant Point Railway and The Cuddy, a thatched house on the Waimate Walkway. Then you will cross the Rakaia River, one of New Zealand’s braided rivers, which is an iconic salmon fishing destination. You should also stop at Methven, a ski town. Park your campervan for a bit and enjoy a bike ride or a hike. Then, on to Lake Tekapo. The lake has a turquoise, milky colour from the fine rock-flour suspended in the water. And while the lake is stunning during the day, at night it becomes one of the best places for stargazing. There are several campervan parks for you to choose from, including ones on the harbour and beaches. Don’t miss taking a dip in the Tekapo Springs. Stay close to the coast with this route, staying longer in Timaru, which is located in the Canterbury region. While there, you must make time for Caroline Bay for a swim or a stroll through the botanic gardens. If you are a history buff, check out the museums, which hold Maori and Polynesian artifacts. 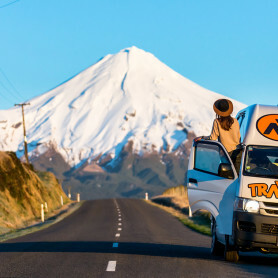 Next up, you’ll head toward Oamaru on your campervan hire, however, we recommend a quick stop by Aoraki Mount Cook, New Zealand’s highest peak. Take the time for a long hike here to take in the best of nature. In Oamaru, you will find some furry friends, with the stunning arrival of blue and yellow-eyed penguins at night. In addition to the natural beauty of Oamaru, the city is home to some of the best preserved buildings in the country, which are made from local limestone. If you’d rather skip the northern stops, head straight to the Middlemarch area for a taste of rural New Zealand. Experience a slower pace of life under the wide-open sky. You will adore the distinct landscape of Middlemarch as well as the wider Strath Taieri district. Be sure to catch a few shots of the Rock & Pillar mountain rain as featured in The Hobbit. Then, end your New Zealand campervan trip with your arrival in Dunedin, a classic Victorian city. It was also the country’s first city so it’s rich with history. Be sure to allow for several days in Dunedin. Take a stroll on the boardwalk of the Aramoana Beach and get a glimpse of the fabled Mole, a long breakwater stretching into the habour’s entrance. The Octago Peninsula is another favourite, full of wildlife, scenic views and heritage. You can also take a tour of Larnach Castle, New Zealand’s only castle.